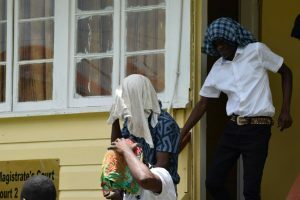 Three of the six suspected bandits leaving the Providence Magistrate’s Court. Six suspected bandits were Tuesday arraigned on gun and ammunition possession charges. Except for Steve Hercules, who pleaded guilty, the others pleaded innocent, were refused bail and remanded to prison until May 10, 2018. Hercules was expected to be sentenced later Tuesday by Providence Magistrate, Sunil Scarce. Defence Lawyer, George Thomas asked the court to be lenient with Hercules because he did not waste the court’s time. Those charged are Mark Prince, 39, Steve Hercules,30, Nabidigi Gobin,33, Renard Khan, 31, Edward Skeete, 30 and 27-year old Marvin Blackman. Police accused them of being in possession of two 9 MM Glock Pistols one serial number that was filed out, along with twenty two live rounds, one Beretta Pistol with eleven live rounds, one . 32 Taurus Pistol -whose serial number was filed out- with six live rounds on April 10, 2018 at Grove Public Road, East Bank Demerara. They also plead not guilty to fraudulently converting a motor vehicle identification number from PVV 6204 to HC 4543. They are also expected to be charged with attempted robbery of a poultry farmer.